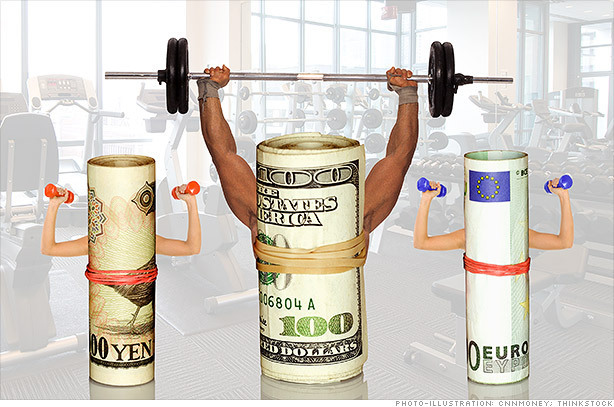 Summary: The strength of the US Dollar is going to affect your sales...even if you only sell domestically. Here's why. Lately you've heard lots of reports about the impact of the strengthening dollar on reported earnings, and consequently on stock prices. McDonald's CEO ended a painful tenure which couldn't survive the earnings impact of the FX shift. Black & Decker grew their sales, but reported lower earnings as the translation of overseas profits was worth substantially less in USD. Two quick examples - and ones which could distract US company management from a couple lurking challenges to a valid manufacturing growth strategy. A recent article explored the National Export Initiative in retrospect. Was it a success? Or failure? Much depends on perspective. What's clear, however, is that awareness of export opportunities as a component of manufacturing growth strategy has been substantially increased through the attention the NEI focused on global sales. While concern over foreign exchange is one of the transactional considerations that worries new exporters, its impact has short and long term implications as discussed in our eBook here. Basically the short term can be managed and the long term must be planned for. And now as the long term trend shifts, companies need to plan. In short, they will encounter a headwind to growing their global sales, as now their products will be more expensive for foreign buyers. That's not a crisis - it's simply fact. It doesn't mean companies can't export, or even that they can't rapidly grow international sales and diversification. It does mean, however, that their manufacturing growth strategy will have to account for changing background conditions. There's another, more urgent implication for every US company - even those that only sell domestically. And it's going to aggravate what M&D companies have already indicated is their biggest business concern - "pricing & margin compression." Foreign competitors have slashed their prices 20% in USD over the past several months....without sacrificing a bit of their margin. As the USD strengthens, import prices drop - and the already substantial downward pressure on pricing and margins for US manufacturers will intensify. If you change nothing, you'll get hammered by imports which you successfully beat back several years ago...not based on quality (it's all good enough now) or strategy (everyone chases the same buyers with the same story) but simply on price. Period. So it stands to reason, therefore, that if you're already worried about compressing margins, and your competition now has a huge price advantage which costs them nothing in profitability, that you're going to have to change something. And that change had better come in your manufacturing growth strategy....after all, you already wrung all possible waste from your manufacturing operations in '09 & '10. If your sales model is built around selling to qualified leads who have requested a quote for your product/service (e.g. most companies,) you'll simply end up slugging it out for deals with even more intense price competition. You'll feature your extra HP, higher speed, and greater precision. That may matter occasionally. You'll win a few with sales performance, and many will come down to price.....your margins will erode further. If your sales model is more advanced than many competitors, your reps take a consultative approach with qualified leads and work to help prospects understand how to creatively apply your product/service to the business problems they described to you. And that approach represents a first line of defense against imports, many of which will sell primarily on price alone. But price is a selection criteria used to distinguish among those which are 'good enough.' And good enough is a function of how the prospect frames and defines their problem. This is where companies will distinguish themselves. Those which will surge will be those that bring unique business insight to the prospects' challenges. They will draw on domain experience, business acumen and creative perspective to help prospects understand a business solution for their business in the context of how it will help them create more value for their customers. 'Good enough' will become a bigger, deeper topic - and statistically 74% of the B2B sellers who can first bring that insight to prospects will ultimately get the deal. So not only must you be better and more insightful, but you have to be the first to provide that insight! Hate sitting back and letting market conditions dictate your success or failure? We understand. Download our free eBook to explore how a proactive approach to your manufacturing growth strategy can help you seize control despite challenges by cheaper imports.